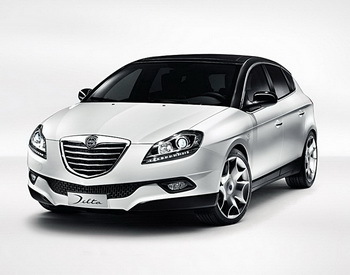 Presented at the Geneva Motor Show three years ago in its final production format, Lancia's Delta is set to get some model year improvements in time for this year's edition including the new Chrysler-derived 'family' grille, some trim level changes, and the 105 HP 1.6 Multijet engine. Presented at the Geneva Motor Show three years ago in production form, Lancia’s Delta is set to get some model year improvements in time for this year’s edition, including the new Chrysler-derived ‘family’ grille, some trim level changes, and the 105 HP 1.6 Multijet engine. The new Delta MY will go on sale from mid-March across key European markets and then from June under the Chrysler badge in Great Britain and Ireland. Lancia will be hoping that the latest changes will help kick-start stalling sales. The Delta has never appealed to buyers outside of Italy and in its domestic market it shifted just 16,846 units in total last year, itself well down from 20,293 units for the full year of 2009. This compares unfavourably to its initial sales targets of 60,000 units per year and is less than half the break-even point of around 45,000 units a year. Based on the C-segment Fiat Bravo (which itself only managed 24,997 sales in Italy last year), the Delta is hampered in particular in the showrooms by being overpriced and with a final finish that doesn’t live up to its premium market positioning. Slightly rejigged specification levels are being introduced to the Delta MY, mainly with new names to replace the current specifications as well as a new fabric material. Starting from the new Steel trim level, which proposes seats upholstered in ‘high-tech’ fabric, the range is completed with the Argento, Oro and Platino trim levels. The Argento version introduces a combination of leather and new ‘Chevron’ fabric, available in beige and grey/black, while the Oro trim level features the combination of leather and Alcantara as standard, a characteristic that makes Delta the only car in its class to offer such a leather in three colours (available in blue, beige or black) as standard. Lastly, the Platino trim level includes Poltrona Frau full grain leather upholstery as standard, plus a leather-clad dashboard with hand-worked top stitching. The Delta is the only car in its segment to offer luxury upholstery in Poltrona Frau leather, available in black, blue and beige with contrasting piping. The Delta's niche Black and Hard Black Packs are being carried over to the new model. Notably, the Black Pack comprises 18” matt black alloy wheels, chrome-plated mirror fairings and twin exhaust, and "Eclissi" black non-standard pastel paint. The Hard Black pack proposes the design concept of the Special Series of the same name introduced in 2010, characterised by a distinctive matt black body treatment: the Delta was the first car not produced in a limited series to sport this exclusive paint finish – called “Cosmo Black” – which requires a long painting process (over 4 hours per car). All the Delta's engines, petrol and diesel, feature turbocharging and are combined with 6-speed gearboxes (manual, robotised or automatic). There are seven in the new range: petrol, 120 HP 1.4 TurboJet (also dual fuel petrol/LPG), 140 HP 1.4 MultiAir and the 200 HP 1.8 Di TurboJet in conjunction with the Sportronic 6-speed automatic gearbox; and for diesel, the new-to-the-Delta 105 HP 1.6 MultiJet, the 120 HP 1.6 MultiJet (also with Selectronic robotised gearbox), 165 HP 2.0 MultiJet and the 190 HP 1.9 Twin Turbo MultiJet. The Euro 5-compliant 105 HP 1.6 MultiJet, already found under the bonnet of many Fiat Group Automobiles models, combines the features of MultiJet turbodiesel engines with the tax breaks and other advantages deriving from the “downsizing” design philosophy. It therefore hopes to be a solution for consumers seeking an effective compromise between respect for the environment and low running costs, without sacrificing too much power and flexibility. In particular, like the 120 HP version, the 105 HP 1.6 MultiJet offers useful torque delivery in absolute terms, which is all the more impressive when one considers the cylinder capacity: a torque of 300 Nm at 1,500 rpm makes this engine a performance leader amongst power units with capacities less than or equal to 1.8 litres. In the Delta 1.6 Multijet application acceleration from 0 to 100 km/h takes 10.7 seconds and the top speed is 186 km/h while CO2 emissions come in at 120 g/km in the combined cycle.